Handball-Planet.com talked with Manolo during his second „free September“ in the last 30 years. First of all, why you left Plock as your results was quite good with second place in Poland behind Kielce and TOP 16 stage at VELUX EHF Champions League? – Our deal which had to be longer was suddenly interrupted after three years. I didn’t work with the president with whom I signed contract Robert Raczkowski, but with Artur Zielinski who established some new way of thinking. 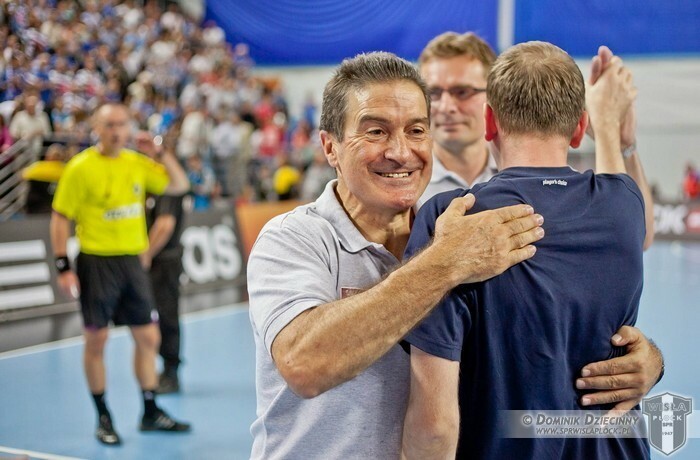 He told me about new contract even before new year, but after EHF EURO 2016, when I took the medal with Spain, he told me that we won’t continue. He decided to break the cycle on four years, in which I believed that will last even longer. I was making the squad in my model, all the players came to Plock according my ideas, but that was interupted. President didn’t want to continue. It’s sad because even better results should come in the future. I don’t understand his decision because results couldn’t be better in recent period. Have Wisla potential to reach results of Kielce or that is some other dimension? – It is a big difference in budgets. Kielce working good, budget is much higher, and it is really tough to reach their level. We have tried to chase them as much as we could, but it was difficult. The year of 2016 was very difficult for you as a coach on both of your jobs. How did you see everything what happened? – Of course, it was hard time for me. I am the man who is giving 100% in handball. I am giving whole energy in every project in which I came in. I went to Plock with the aim to make a team in the long run, but president lied me. That hurt me a lot. Absence from Olympic Games was also tough to accept. We had qualification tournament in Sweden, where home team was one of the best in Europe, but also Slovenia. We missed Rio for only one goal. That is tough to accept after three years in which we were third and second at European Championships and fourth at Qatar 2015. Bad luck. From this point of view, what you would change in crucail matches against Slovenia and Sweden? – We lost against two great teams, and despite it was only a question of one goal, I can’t say that only bad luck or bad day. Slovenia were better in the last 20 minutes. We have to admit that and to take responsibility, both players and myself. The way how I finished things in Plock and Spain, gave me even more energy for new projects. I am eager to work and to give the best for the things which will come. I would like to work with serious president who will give me the freedom to make serious team as a part of serious project. I would like to work on making team, changing their habits and visions, with a lot of trust and energy. That only can make difference and bring titles. Are you more interested to work in club or with some national team? – I would like more in the club. It is different work. I didn’t have time and space to work and talk with the players in Spain. I would like to follow players in NT, to speak with their coaches and to form them in a way necessary for the national team. I would like to work and to produce players for the national team level. Of course, you can’t choose. I have some offers to go to Qatar, but I would like some bigger challenge in the European leagues. This is the second time in my career that August is free, but I used to take some more energy to be ready to give soul and everything into the next project. It is also a good chance to take a look back. How do you see Olympic tournament in Rio? – I expect such a tournament from many of the teams. At the end, Denmark beat the pressure and won it. That is a positive thing. They , finally, broke the mental barriers around them. Among positive things is work of Jordi Ribera in Brazil, my successor in Spain. They beat Poland and Germany – two TOP class teams. They had bad luck to go on France in quarter-final. He is a good choice for Spain. I wish him a lot of luck. He deserved a lot of success in Spain. Of course, Slovenia gave good impression. They played good, it is visible good work of Vujovic. With one or two players more in rotation, they could go even further. Germany continue to shine with Dagur Sigurdsson on the helm and that is good for handball. How do you see new rules implemented in Rio? – In general, I don’t like new rules. I wouldn’t use seventh player if I don’t need. Positive is passive play as referees have less influence. Game is faster. Good thing is that injured player has to miss three attacks, it’s good to stop simulations. – It is very interesting solution in my opinion. I like dynamic play, not to lose time on nothing. Some teams lose 10-15 seconds to come from defense to attacking positions. For the non-handball people in front of TV is totally unknown why they are so slow. What they are doing? It could be interesting with shot-clock. Despite ASOBAL isn’t anymore comparable with Bundesliga or LNH, and most of the coaches working abroad, youth generations of Spanish national team making TOP results on international level. Who produce those players? – We had already a good coaching school. In the past, we could learn from the best handball players who played across Spain. We were growing up with them, making higher standards and clear visions who handball has to look like. We learned a lot and improved ourselves as coaches. Currently, we need better material (psychical predispositions) in handball, but of course, system giving the results. – Their work starts from Federation, who are making serious plans, while in Spain is more on club and our coaching school. That is the main difference, but also, we can’t discuss about financial aspects as it is a big difference between these two countries – concludes Manolo Cadenas his talk for Handball-Planet.com. Next Story → VIDEO: Handball Peter Pan magic!